There are a lot of field guides out there; and if you are a big birder you probably have your favorite. You reach for it each time you go out in the field and if you are like me it has been a constant companion for many years. Many of you also have a smart phone and you take that wherever you go as well. But are you using it to help you identify the birds you see? How about using it to compile your life list? You could do just that and more if you are using some of the e-field guides that are available. I am going to take some time and go through and look at a few of the major birding field guides that are available in app form. There are several that are available but I am going to focus on four of them. They are for the most part probably going to be one of the field guides that sit on your shelf. All of these apps have several common features that include the basic information you find in any field guide (Range Maps, Descriptions of Habits, Habitats, and Images or Drawings of each of the birds) along with audio of the bird calls. This week I am looking at The Audubon Guides. 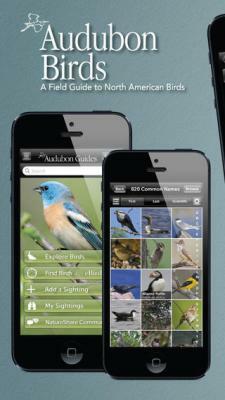 They offer a number of field guides that can be accessed from a single app. This is a nice feature that allows all of you field guides to be located in one app and allows for quickly moving between field guides. It also will save your back if you like to bring several field guides along with you as you hike. This app uses photographs of the birds, which are high quality and very clear. This app has several features that I really like and some that are a little clunky. Though these features are nice to have are either not necessary or are not as smoothly integrated into the app as some of the others. This app allows you to narrow your results by physical characteristics that include shape, color, habitats, region, and size. It also includes categories that are unique to this app (Song or call type, song or call pattern, and locomotion). The information is very nicely laid out and is easy to navigate. One very nice feature to this app is the option to highlight key features of some of the birds; and in some cases, it will highlight some of the differences between similar species. Though this app has many advantages there are a few drawbacks to this app. Some of the features require an internet connection. Though this is not a problem in most places the app is not fully functional if you are without or in an area where the network connection is low or slow. The app works with eBird and you can sign into eBird through the app and report any sighting that you have made. Unfortunately this is on the home screen and you cannot do this from the identification page. Though not a big problem it would be nice to do this once you have identified the bird. The biggest drawback is the price of the app. Just the bird guide is $9.99 in the Apple App store and $3.99 through the Google Play store (though only the birding guide and wild flowers are available on the android operating system). Overall this is a nice app and it allows you to integrate your sightings with your eBird life list in one location. Despite its minor functional shortcomings it is a good choice for an all-round platform for your field guides. For more information please contact Jason Haupt (jdhaupt@illinois.edu) 309-547-3711.